We really hope you and your children had a great night trick-or-treating. We love Halloween so much here at SmileTown Dentistry Burnaby. Seeing what costumes children are wearing and their faces light up when they receive candy are a couple reasons why. Speaking of candy, if your children may have had too much, you can always book a no-obligation consultation with us to ensure no cavities are popping up. Another big reason we love Halloween is the pumpkin carvings! Pumpkins are a fantastic canvas for everyone to showcase their creativity. 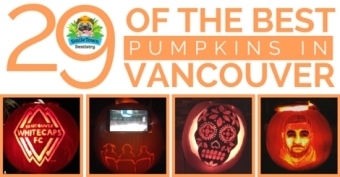 We thought it would be fun to comprise a blog post highlighting the best carvings in Vancouver. We have been scouring Instagram and Twitter in search of the best pumpkin carvings over the last couple of days and found some amazing works of art. Thanks to everyone who allowed us to use their photo and pumpkin carving. Enjoy!